Absolutely not, I am perfectly sane. Well, some people might dispute that, but winter is a great time to can food. When August hits, my house is way too hot to do any more canning. Eventually I end up tossing the rest of the ripe, whole tomatoes into gallon-size freezer bags and stuffing them in the freezer until winter. My house is chilly in the winter and the warmth from an all-day canning session is very welcome. That's when I make and can tomato sauce. Another advantage of using frozen tomatoes is that the skin slips right off when you submerge the tomato in water for a few minutes. You don't have to blanch and then chill them first. Winter is when I take bags of berries out of the freezer and make jelly and jam. Whether it's blackberry jam or fruit scrap jelly, it's easy to dump the bags of fruit into the kettle and cook them down to make jelly or jam and can it. Besides, the different kinds of berries aren't all ripe at the same time in summer, so freezing them until winter is a nice way to make jam from several different kinds, such as triple berry jam. 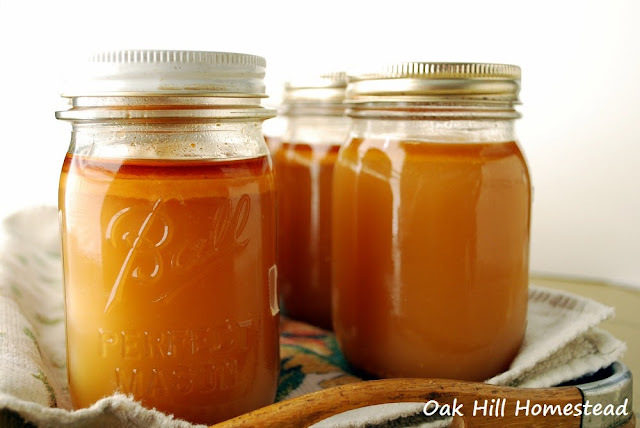 If you froze bags of apple peels and cores after making applesauce, you could use them to make harvest apple jelly. Tomatoes, jelly and jam can all be waterbath canned. Vegetables and meats must be pressure-canned. So that big five-pound bag of carrots hubby bought, not knowing we already had three pounds in the crisper drawer? I need to pressure can those carrots. If you're like us and are tired of turkey leftovers now, use those bones to make turkey broth and then pressure-can it along with any leftover turkey. No turkey carcass? Use chicken bones and make chicken broth instead. Mason jars of chili or soup are quick and easy to heat up for lunch or for dinner on hectic nights, so why not make a big batch and pressure can some? Soups with noodles or potatoes are best canned without those ingredients, then add them when you open the jar and heat the soup for dinner. You can even can dry beans. Canning your own means you have ready-to-use beans on your shelves and they're so much less expensive than buying canned beans from the grocery store. 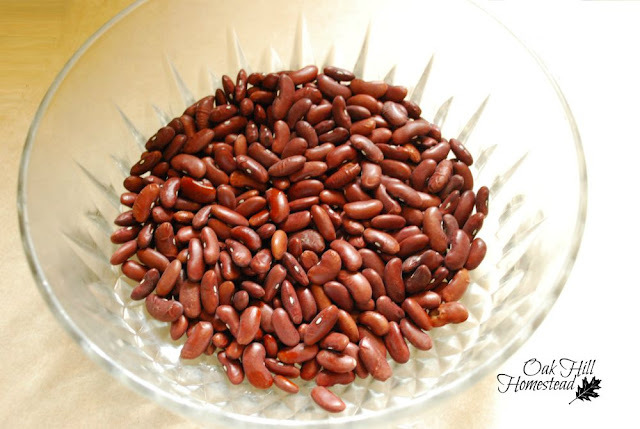 If you grow shell beans in your garden, canning them means you can use them at the last minute instead of having to soak and simmer them for hours. Just remember that while fruit can be waterbath canned, vegetables and meat - anything other than fruit - has to be pressure-canned. 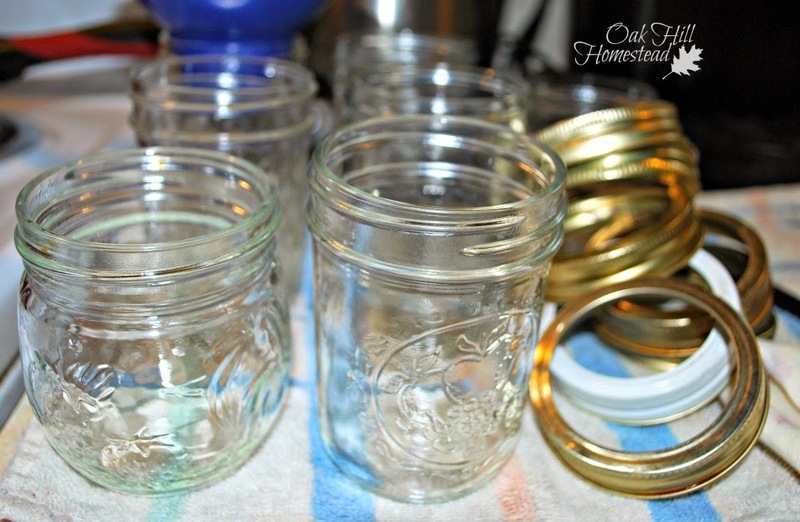 You don't have to stop canning food just because gardening season is over. Take advantage of winter vegetables, frozen fruit, homemade broth, and sales on dry beans to fill your pantry with Mason jars of delicious food. This post has great ideas! I love to can and was just thinking of doing some carrots. I love having jars of carrots on the shelves; I bet you will too, Helen. Thank you so much for sharing this on The Homesteader Hop! I am impatiently waiting to get a pressure canner, and like you my house gets pretty chilly in the winter making it the perfect time to can! Winter really is perfect for canning. :-) I hope you get your pressure canner soon, Staci... maybe for Christmas! Great ideas Kathi! Thanks for sharing. I'm canning our turkey broth today! Love having it ready for soups, etc. I also do my own canned beans in the winter. Love the idea of tossing the tomatoes in the freezer for making sauce later--going to have to do that! Yes, Kim! I love having chicken and turkey broth on the shelves. I use it a lot. What kind of beans do you can? Boy, are you right about it being more enjoyable in the winter. Although I've only done water-bath canning so far. I'd like to pressure can, I even have one, but I'm afraid of it. Kathi, you're brilliant! Yes, why do this in August when you can do it when it's cold?! I've been freezing a lot of things this year, including a jar of homemade turkey broth and some turkey gravy. I love this Kathi. :) This is also when I make up large batches of chili or soup, have a small portion for dinner and can the rest. Much nicer than when it's hot out. Lady Locust, it's much more bearable, isn't it? Winter is the best canning season of all! We do our soups, jams, jellies, beans, etc.! Bonus! We can turn down the heat! I really *like* canning in the winter. It sounds like you do too, Tammy! Great info! I was just looking for a tutorial on canning frozen tomatoes! Thanks for being on the Homesteading Blog Hop! Hope to see you next Wednesday! I'm glad it was helpful, Sarah. Those both sound delicious, Jan. I've never heard of pineapple jam before. Where we live, certain fruits like citrus and pineapple don't come into season until winter anyway. It's a great opportunity to make marmalade. Haha, so I don't think you're crazy -- if you are, I guess I am too! I have never actually done any canning but I know a lot of folks who do so I've pinned this post to share it, Kathi. I didn't realise you could can (thawed) frozen produce - I'm always interested in learning more about these things. Thank you so much for being a part of Hearth and Soul. Hope to 'see' you again this week! Thank you for sharing, April. So if we were to have a winter wedding, that would be another source for us of canning contents. That is such a special tradition! I love it, and especially the way you label the jars. I had no idea that lettuce could be used in soup; that's good to know. Thanks! Hi Kathi, I always learn so much from you. As a city chick, who is not used to all this stuff, I have a hard time keeping up with all the produce I grow. Of course it makes perfect sense to throw it in the freezer until it gets cold. Who wants to can in the middle of summer in Texas? Hoping for a pressure canner for Christmas. I love to can in the winter. Especially when someone has a cold, the humidity is a bonus. And the warmth is so welcome when the house is chilly. 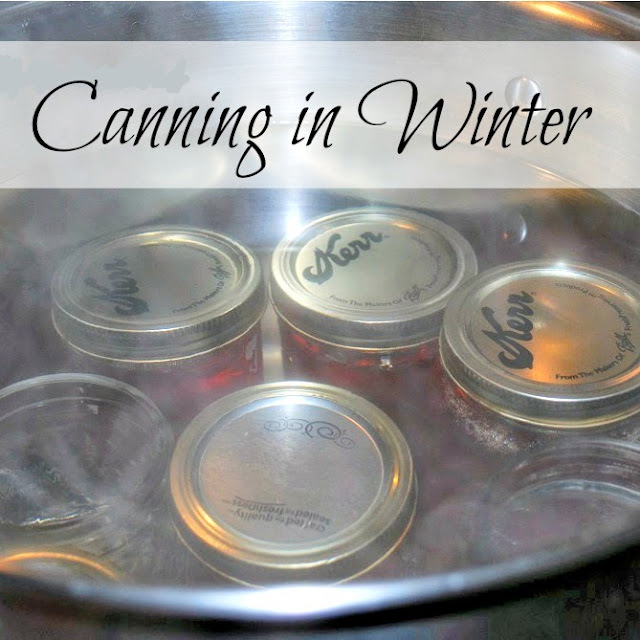 Great tips for canning in winter. Plus the steam in the air is always nice for me. My skin gets so darn dry too! The steam is a nice side benefit too, Christine. Thanks!